Deciduous and mixed forests, especially hemlock-hardwoods, often in moist ravines and along trails. Occurs in North America from southern British Columbia south to central California and east to northwestern Montana. It is found again in the Black Hills of South Dakota and is then disjunct to the upper Great Lakes region. In Ontario, it was collected on the Bruce Peninsula in 1895 and, 99 years later, near Owen Sound. 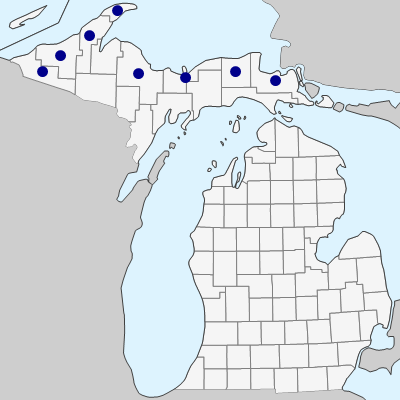 Otherwise its only documented occurrence around the Great Lakes is in the Michigan counties bordering Lake Superior (although it may grow considerably inland in those counties). 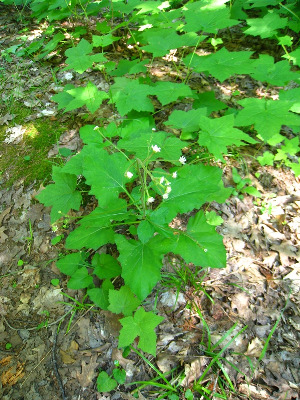 The bicolored leaves (green above and white beneath) are distinctive at all times, crowded near the base of the stem, with long petioles and ± triangular blades sinuate or shallowly lobed. The leaves are the source of the apt epithet bicolor and also the common name, for as one hikes in forests where the plant is common, the disturbed leaves with bottoms exposed reveal one’s trail. The short gland-tipped hairs on the stem (whence the name), inflorescence, and achenes are even more distinctive. The small white disk flowers are in a little button-like head, with the elongate, sticky-glandular achenes looking rather out of scale. MICHIGAN FLORA ONLINE. A. A. Reznicek, E. G. Voss, & B. S. Walters. February 2011. University of Michigan. Web. April 19, 2019. https://michiganflora.net/species.aspx?id=210.